l 5 Hydroxytryptophan is the precursor to serotonin, a mood and appetite regulating neurotransmitter produced within the body. It has been combined with Vitamin C and Vitamin B6, an important cofactor in the conversion to serotonin. Nature&apos;s Way uses natural l 5 HTP extracted from Griffonia simplicifolia beans produced in easy to swallow, enteric coated tablets to minimize any potential gastric discomfort. 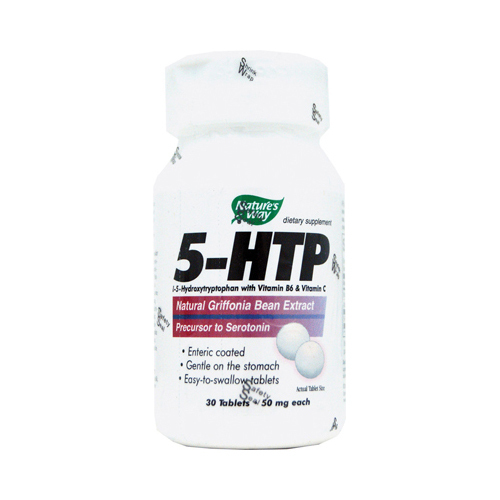 Vitamin C (ascorbic acid), Vitamin B-6 (as pyridoxine HCl), and 5-HTP (l-5-Hydroxtryptophan). Other ingredients: Cellulose, Maltodextrin, Modified cellulose gum, Stearic acid, and Aqueous Coating Solution.